When you come home from the grocery store which items do you put in your fridge and which do you leave on your counter or put in your pantry? Sometimes it is hard to know where to keep a certain product, especially if this is your first time buying that product. Or you may have been buying that product for years, but perhaps you were storing it incorrectly and always wondered why it went bad quickly, or just never tasted quite right. For starters it could be because you were putting certain foods in your fridge instead of storing them elsewhere. 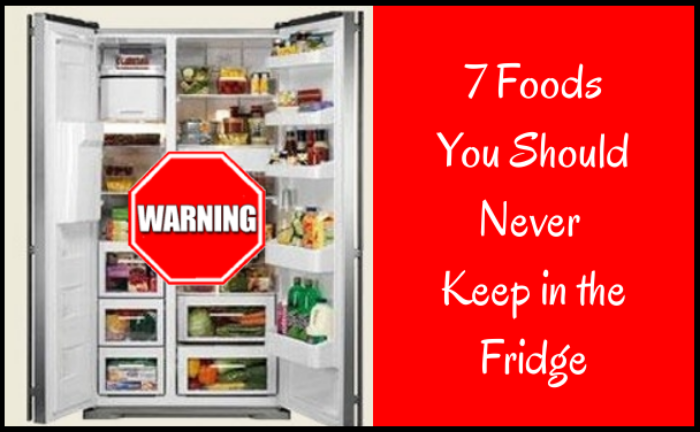 Here are 7 foods you should never keep in the fridge. Potatoes are best stored in a cool, dry, dark place. And they should be stored by themselves. We keep ours in a room in our basement that we rarely go into. And our cats can’t get in there either, so we don’t have to worry about them sniffing the potatoes. After you buy your potatoes and bring them home, remove them from the plastic bag they are in and place them in a clean cardboard box. Do not wash them until a few minutes before you need them. If you do not use them often, make sure to check-in on them occasionally because eventually they will go bad and a bad potato smells nasty. Fresh garlic is something that you should definitely store at room temperature. We place our fresh garlic in a small bowl and keep it our kitchen pantry, where it is dry and dark. Avocados are something that we rarely buy, but the last time we did we automatically put them in the fridge. When I went to use them a few days later they seemed okay. Since then I have learned that if you want them to ripen you should never keep them in the fridge. But if they are already ripe, then it is okay to store them in the fridge for a couple of days. Years ago people started saying that if you have a large amount of coffee beans the best way to keep them fresh is to keep them in the freezer. But then people confused freezer and fridge and figured if the freezer was okay the fridge would be okay too. The best way to keep your coffee beans fresh and full of flavor is by keeping them out of the fridge. For small amounts use an airtight container that you can place in your pantry or leave on the counter. You can store a large bag of coffee beans in the freezer for up to one month. If you store your liquid honey in the fridge it will start to crystallize and the next time you go to use it you will find it difficult to squeeze out of the bottle. The best place to store a bottle of honey is in your kitchen pantry or cupboard. Make sure the lid is on tight, and you will find that it will taste great for a long time. Do you store your tomatoes in the fridge? We use to until we realized that the cold fridge zaps away all the good flavours in the tomatoes. If you want to eat delicious tomatoes then keep them out of the fridge. Place them in a basket on your counter top. Or if you have pets that may want to play with them, you can always put your basket of tomatoes in your pantry. I have never actually put bananas in the fridge. However, once they are quite ripe, I do peel all of them and wrap them in plastic wrap so that I can freeze them for my smoothies or to use for baking later on.